How then, did the music of Frank Zappa and the Mothers of Invention disseminate in such a conservative environment? It wasn’t through the media, I can assure you. Growing up, everyone I knew who had Zappa and Mothers of Invention albums had been turned on to the music by somebody else – a friend, a brother, a cousin. Even the albums themselves had to be imported from more liberal and cosmopolitan Canadian cities at the time – Vancouver, Toronto, Montreal. Word of mouth was really the only means of promoting Zappa in those days. Certainly the local top 40 station never played one cut of Mothers music in my memory. Indeed, as I’ve mentioned here at KUR often, my discovery of Zappa occurred when I was seven years old, finding a copy of Just Another Band From L.A. on a cousin’s stereo turntable. The rest, they say, is history. That chance musical encounter affected my musical tastes far, far more than all the Country and adult easy listening music I was forced to endure at my parent’s hands. It set me on a collision course with them, musically speaking, which resulted in many of my Zappa and Mothers albums being flung against the hard plaster walls of their house. Indeed, it may very well have been one of the reasons which lead to my moving out of their house at age 16 (but not the reason, I’m sure). Even now, 31 years later, my surviving parent and siblings still refer to Zappa and the Mothers as “that music”. And if ever I find it necessary to clear my present flat of family, all I need do is play a little Zappa, and they are “gone, gone, gone”. 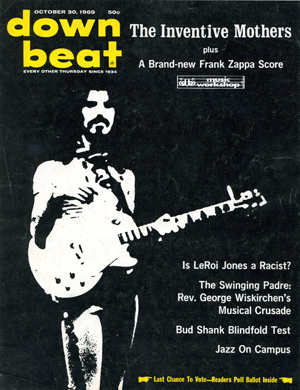 During my teen years in the long-ago ’70s, Down Beat was an essential resource — their thoughtful, deeply knowledgeable reviews gave me musical insights I never would have obtained from rock journos. And their openness was astonishing, favorably reviewing ambitious rock music with the same seriousness they applied to jazz. First review I ever read of Tommy Bolin’s Teaser album was in DB (four stars, iirc); as a newly-minted jazz and fusion fan in those days, DB was manna from heaven. I was knowledgeable about George Duke and Jean Luc-Ponty long before I began my Zappabout. You are reading Zappa & The Mothers – Does Geography and Media Influence Musical Tastes which was posted on Sunday, April 10th, 2011 at 7:28 pm by urbangraffito. This entry is filed under Frank Zappa, Miscellany, Personal, Visual Arts.